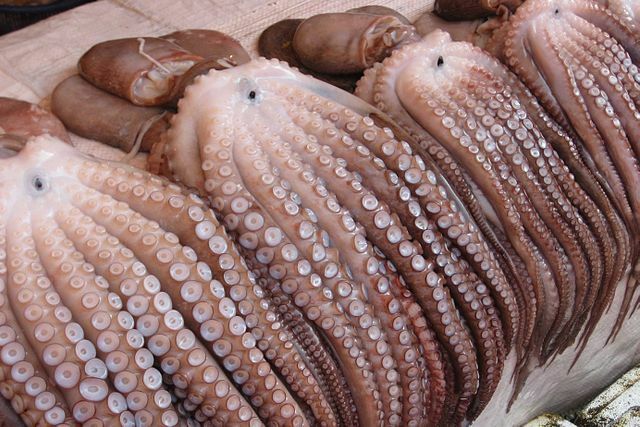 If you are making calamari, paella, or another dish, squid can be purchased fresh, frozen, whole, or cut up for cooking. Learn how to select squid and how to store it for future recipes or after creating your dish. Finding fresh squid that has not been previously frozen may be difficult if you aren't at a seaport where it is harvested. The fishing season for California market squid is from July to November, so those are the months when you may see fresh, never-frozen squid in local markets. You are more likely to find thawed, previously-frozen whole squid at a market such as Whole Foods, a fish market, or an ethnic grocery. Buying whole squid allows you to clean it yourself and harvest the squid ink to use in recipes. If you buy cleaned squid it will already have the skin, ink, entrails, cuttlebone, and beak removed. If you want to cook your food quickly, choose smaller squid with clear eyes and moist flesh. Smaller squid is more tender than the larger ones. The aroma of the seafood should be clean like the ocean with no strong, fishy smell. For previously-frozen squid, avoid it is there are too many ice crystals or other signs of freezer burn. If it wasn't frozen properly, it might have a reddish tinge. You can find frozen squid in most supermarkets and ethnic markets. You can choose squid tubes, which are the bodies, cut rings, and tentacles. These typically are already cleaned and ready to use. You will probably end up having to buy two to three pounds at a time. When you are going to use frozen squid, allow it to thaw in the refrigerator. Do not leave it out at room temperature to thaw. You can also thaw it in cold water, with the water either running or being changed every 30 minutes. If you are going to use it immediately, you can thaw it in the microwave. After buying fresh or thawed squid, cover the squid tightly and refrigerate it in the coldest section or on a bed of ice. Fresh or previously-frozen thawed squid should be used within two days. For food safety, you should never refreeze previously-frozen seafood, so it is important to cook it and then, if necessary, freeze the cooked squid. If you bought fresh squid, it can be cleaned and frozen immediately for later use. To freeze uncooked squid, place the cleaned squid in heavy-duty plastic freezer bags, being sure to squeeze out all the air, and seal tightly. Use it within two months. Cooked squid may be refrigerated in a tightly sealed container for two to three days or frozen for two months. Be sure to keep any raw seafood away from salad ingredients and other food that you will not be cooking before it is eaten. Don't use the same utensils, cutting boards, or plates for raw seafood and other foods. Wash your hands well after handling raw seafood.